Small enough for your gig bag but packed with full size features for your full size guitar! 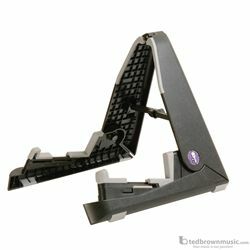 The GS6500 is the scaled-up version to our popular Might Uke Stand. It's kept the compact and lightweight design, but can handle electric, hollow body electric, semi-acoustic, dreadnought, classical, bass, and 3/4 size guitars. Folds to a compact 12.25" x 5.85" x 1.65" size. Adjustable yoke depth accommodates common body sizes from 3-5/32" to 5-1/8".